Get 6 Meals for $36 from Gobble! Do you lack the time to cook up a full meal with your hectic schedule? We found a great company that gives you a solution without breaking your budget; Gobble. 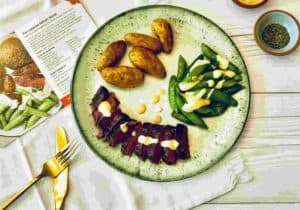 They not only provide a great menu of different meal options at affordable prices but also offer dinner kits that can be whipped up in as little as 15 minutes. Take advantage of this fantastic Gobble promotion code now and see why we at Meal Kit Review strongly recommend their menus and services. Your taste buds will thank you. While Gobble cannot offer you a free meal or a free trial for now, they can offer this fantastic promotion: Get 6 Meals for $36 from Gobble. We at the meal kit review have the enviable job of trying different meal-kit company dinners and lunches. After all, if we are going to recommend a specific company, we are obligated to try every meal on their menu. Gobble’s menu provided us with a broad spectrum of healthy meals that kept us fit and healthy. Nevertheless, we take our palates seriously. We were overjoyed by the taste of the Thai Basil Chicken with Brown Rice. The chicken was delicious, and the sauce was packed with flavor. The Thai chilies will leave you panting, so if you like spice, this is where to get it. It’s a healthy dinner that’s sweet and savory. The Tuscan Sirloin Steak was incredible as well; rich, juicy, and flavorful are some adjectives that come to mind. The three peppercorn sauce makes our mouths water just at the thought, and it was exactly as tasty as you’re imagining. This was cooked and ready-to-go in about 15 minutes. Right from the jump, Gobble allows you to decide what eating restrictions you want to adhere to and takes these into account for the meal plans. Gobble has two plans, designed for the number of people that are going to be sitting at the table. Gobble will ship out 6 meals each week, which translates to three different meal kits. While you can set restrictions on what you’d like to eat, you have the freedom to make changes every week. Maybe you decide you don’t like the Pan Roasted Chicken, so you want to go with the Piccata the following week. That’s entirely up to you! Gobble sends out 12 meals for members on the 4-person plan. That’s three different kits, same as the above, but meant for more people. As stated above, the whole menu is available to you: from meat-lover to vegetarian options. Easy – All you have to do is order, unwrap, quickly prepare and serve; no need to plan your meal nor go shopping for ingredients. Time Saver – Avoid all of the time-consuming chores associated with cooking your own meal. Options – Have different options to choose from one menu. It’s like eating at a fabulous restaurant every night. Save Money – You will save money by not having to buy products and ingredients in quantities that you will not use all at once and will thereby just sit in your fridge. You won’t be paying restaurant prices for professional meals either. Flexibility – Choose meals according to the number of people, and their appetites, that will be at your table each night: Planning a dinner party? No problem. You decide the amounts and recipes. You will have a lot more time to spend chatting with your guests instead of being in the kitchen. Keep an eye out for Gobble promotions and plan accordingly. Gobble sends out so many delicious dinners, including some high-class steak options like a Filet Mignon with Asparagus. They have great options on beef, poultry, pork, and fish. They also have vegetarian dishes, but as of yet no sign of vegan options. Perhaps in the future, they’ll be able to accommodate vegan choices! They’ve also recently launched a Lunch Box which is certain to appeal to both old and new members alike. 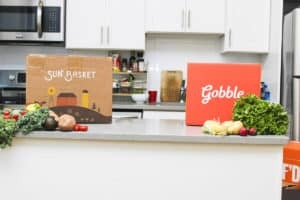 Gobble was chosen as the #1 meal kit company by Parents Magazine in February of 2019. They found it to be a good solution for a lot of people. Parents who want healthy meals while saving time would probably fall in love with Gobble. People busy with careers who want to decrease the time they spend in the kitchen will also find something that fits them at Gobble. They were also convinced by being one of the fastest and simplest meal delivery services on the market which provided mouth-watering dishes. 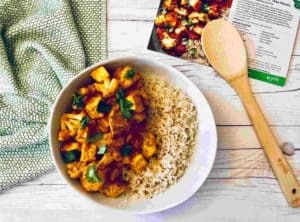 We, at Meal Kit Review, agree with them while adding that their ability to accommodate a wide range of dietary needs and restrictions is also very important. Their food is incredible, the menus have great variation, and the service itself is easy to use and enjoyable. They are fast and convenient. Their packaging of ingredients very well organized, and the fact that you can cook the kits in just one pot or pan is really convenient; It made for very little clean up afterward. We found that ordering and canceling orders to be very simple. You can even cancel orders directly on the website. Their additional options of kid menus, salads, soups, drink mixes, and desserts are also a Godsend! The Gobble website is easy to navigate, and you will find friendly customer support from the get-go. The option of being able to give “The Gift of Gobble” is also a nice touch. There’s a fantastic deal available, so try them out today! We sure are glad we did!